This book was the one Christmas present I asked for. I’d been dying to read it for ages because (full disclosure) I ‘know’ the author from online from way back when we were both teenagers, and I wanted to buy it to support her (and also because I couldn’t get it through my local library). Well, through the vagaries of online shopping, it only just came into my hands. Even though I live in Europe, my husband had gone for the American edition and I’m so glad he did. The cover is lovely and the edges are rough-cut, so it’s a real treat for someone who normally reads ebooks. I mean, are hardcovers usually this beautiful? But if the physical trappings are lovely, they cannot even hold a candle to the quiet, sorrowful beauty of this book. The story revolves around two sisters, Evelyn and Philippa, and what happens after they return from a mysterious other world–how they try to put their lives back together when they are used to the extraordinary. It is impossible to talk about this book without talking about C.S. Lewis’ The Lion, the Witch, and the Wardrobe (more on this later). Evelyn is a ‘Lucy’ who struggles to fit back into the ordinary world, and Philippa is a ‘Susan’ who has to pick up the pieces, knowing she never truly belonged to the other world. More than anything, this book is for everyone who read The Last Battle and thought that Susan had been treated shamefully. 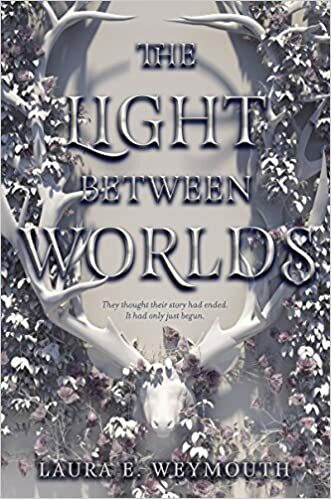 A Light Between Worlds is YA, and I understand why–it is about two young woman struggling to find themselves and who they truly are. There are sweet romances over toffees and sandwiches, chaste kisses that hold the promise of something more but that never quite get to that point. But do not be fooled–this is a deeply, profoundly sad book (and there are some scenes that are probably not suitable for younger readers, as Weymouth herself is careful to say). It is hauntingly beautiful in its sorrow and in the sense of loss that pervades both Evelyn and Philippa’s stories. Weymouth’s prose is gorgeous. It is not often that I really notice beautiful prose when I read, but Weymouth’s really shines, especially in Evelyn’s chapters. I have said that it is impossible to avoid the Narnia connotations, and I am sure that is intentional. I’ve also seen reviews that call Weymouth’s ‘The Woodlands’ a pale imitation of Narnia. But I think those reviewers are missing the point. The scenes set in The Woodlands, which are guarded by a noble stag instead of a lion, are told as flashbacks, and this is for a reason. The only point of these scenes, which appear only in the first half of the book and from Evelyn’s perspective, are to show what the characters have been through only to illuminate how they feel upon their return to the ‘real world’. They are also to show the depth of Evelyn’s longing for the world she has left behind. These flashbacks are never meant to be a retelling of Narnia, but they still manage to offer a compelling narrative for these characters. Narnia is so beloved by many, a part of so many childhoods, that to seek to ‘reboot’ it would be folly. Wisely, Weymouth doesn’t try to top that world-building, merely to invoke it, although the narrative she tells within that world is different enough to set it apart. Philippa is absent from the first half of the story except for these flashback scenes; at first, we only know her from her sister’s perspective. It is only later that we see her own struggles, the depths of her guilt and her sorrow. She runs from those memories across an ocean, but I do not think it coincidence that Weymouth has Philippa attend university in New Hampshire. That is my home state, and I know that if you were trying to run away from the memories of forests, New Hampshire would be the last place you would choose. It is never stated, I don’t think even really hinted at, in the novel, but I think that Philippa’s sojourn to New Hampshire was her own way of trying to find The Woodlands in the real world, in a different way than Evelyn tries. If you are looking for epic fantasy, or for the struggle of good versus evil that Narnia was all about, this is not that–as I have said, it does not try to be a rehash of Narnia. This is a quiet book, and for that I am utterly grateful. Most of the plot takes place over tea or sandwiches, or in the sharing of toffees on a train, or in gardens. The plot unfolds through conversations, the sharing of little pieces of one’s soul. I wept through most of this book, not only because it was sad, but also because it was beautiful. One scene set in a farmhouse kitchen, where Evelyn meets the family of her friend Tom, first broke me down, and I am not even sure why. But it was a cathartic experience, one that lingers, and I am thankful for it. Share the post "I waited to make this my first CBR11 review. It was worth the wait."